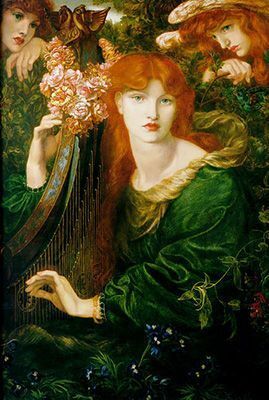 The below artworks are the most important in Art for Art's Sake - that both overview the major ideas of Art for Art's Sake, and highlight the greatest achievements by each artist. Don't forget to visit the artist overview pages of the artists that interest you. Artwork description & Analysis: The American-born painter James Whistler was a central figure in Britain's late 19th-century Aesthetic movement, which made 'art for art's sake' its rallying cry. Color and mood were crucial to his art, his paintings often bordering on abstraction. 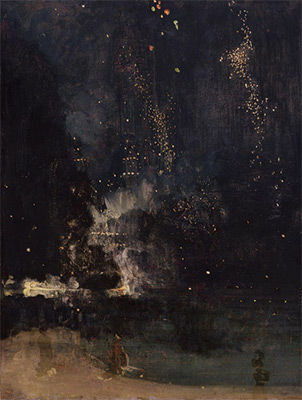 His titles, like that for Nocturne in Black and Gold, often emphasized these formal qualities, over and above the ostensible subject of the picture, which in this case is a fireworks display on the River Thames in London. His titles also often borrowed musical terms such as 'nocturne' and 'harmony', thereby insisting on painting's relationship to the arts in general, rather than its relationship to the outside world. When he exhibited Nocturne at the Grosvenor Gallery in 1877, the critic John Ruskin accused him of "flinging a pot of paint in the public's face." Whistler famously responded by suing Ruskin for libel, and though he won the case, he was awarded only a tiny amount in damages, and the huge costs he incurred later led to his bankruptcy. Artwork description & Analysis: Duchamp's Fountain staged the 20th century's most powerful attack on the notion that art can be judged separately from other spheres of life. Duchamp did not create the work so much as chose it, purchasing a conventional urinal and signing it with a pseudonym, R. Mutt. Submitted to the 1917 Society for Independent Artists, the object should have been included without debate in the Society's annual exhibition, since membership alone entailed the right to exhibit. But Fountain was rejected on the grounds of immorality, proving that, despite assumptions to the contrary, other value judgements - such as, in this case, morality - did indeed inform aesthetic judgement. 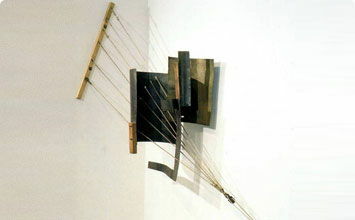 Curiously, however, Fountain's supporters did employ a version of the notion of 'art for art's sake' to defend the object, arguing that Duchamp's choice of the object imbued it with special significance, hence making it eligible for consideration as art and putting it beyond the bounds of complaints about morality. So if the affair demonstrates the beginning of the end of 'art for art's sake' in the 20th century, it also shows its strange tenacity. Artwork description & Analysis: Full Fathom Five was among the first drip paintings Jackson Pollock completed. Its surface is clotted with an assortment of detritus, from cigarette butts to coins and a key. The top-most layers were created by pouring lines of black and shiny silver house paint, though a large part of the paint's crust was applied by brush and palette knife, creating an angular counterpoint to the weaving lines. Pollock's drip paintings have been interpreted in numerous ways, some seeing them as inventing a new abstract language for the unconscious, others suggesting that they evoke the night sky, or in this case, the depths of the ocean. However, the critic Clement Greenberg, who was Pollock's most powerful outspoken supporter, insisted that their value lay purely in their formal achievements, such as the manner in which they broke up the rigid, shallow space that had dominated abstract art since Cubism, and replaced it with something more loose and open. Greenberg held a strong belief in the inherent value of abstract art, arguing that it offered the only means in which to say something new in a world increasingly full of conventional, representational images. He also believed that formal analysis held the key to making judgements about quality in art, and discussion of all other matters - i.e. theme, subject matter - was irrelevant. And although Greenberg rarely used the term "art for art's sake," in these respects the doctrine had a powerful impact on his thought.